Harry Potter fans know well the significance of the Golden Snitch and likely carry an image in their minds that it looks something like the Snitch shown in this photograph. A Snitch is a living, golden sphere with wings that measures approximately the same size as a walnut. In the Harry Potter books and movies, the Snitch flies all over the Quidditch field trying to avoid capture. When caught, he is worth 150 points and with his capture, the game is over. In the real world or muggle version of Quidditch the Snitch is actually an individual, usually dressed in golden yellow who is fast, agile and entertaining. His (or her) capture also signals the end of the game. 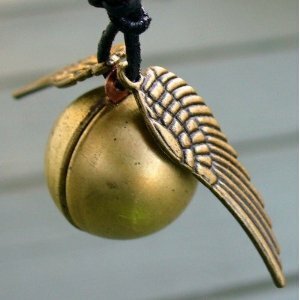 Fans of Harry Potter and/or the real world game of Quidditch who would like to possess the Golden Snitch can actually purchase one from Amazon. 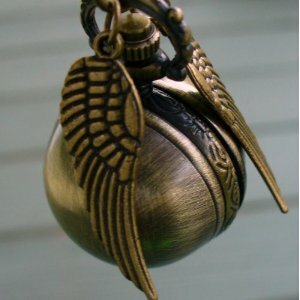 The Snitch shown at the top of this page is actually a necklace and locket, opening up to reveal two spots in which to put your favorite images. These jewelry pieces are not extremely expensive items, so don't expect solid brass but do expect to add an unusual Harry Potter piece to your collection. 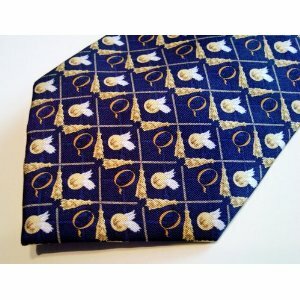 We also like this Golden Snitch necktie, which is a bit more expensive but not extremely so for a neck tie that looks to be a particularly handsome and unusual Harry Potter gift idea. We're impressed with the selection of Harry Potter Golden Snitch themed merchandise and think any of these choices would be a TOP-RATED GIFT IDEA for a Harry Potter fan. However, if we haven't shown you something you like, or you are just plain curious, you can click here to see Amazon's complete collection of Harry Potter Golden Snitch merchandise. The Best Harry Potter Gift Ideas.